Shared rides let passengers going along the same route to share a Lyft ride, a big step toward our mission to improve people’s lives through the world’s best transportation. As a driver, you'll enjoy longer rides and less time between rides with the chance to earn more. Shared ride pay is calculated by distance, time, pickup fee (base charge), and Prime Time (if applicable) for each route. If Shared or Shared Saver rides are available in your region, check your Rate Card for local pricing. You're always paid the base fare plus the time and distance of the entire route, which means your earnings aren't affected if the first rider doesn't get matched with another rider. If a passenger lets you know that they're traveling to a different drop-off location than the one they entered or that they are making more than one stop, ask them to cancel the ride. 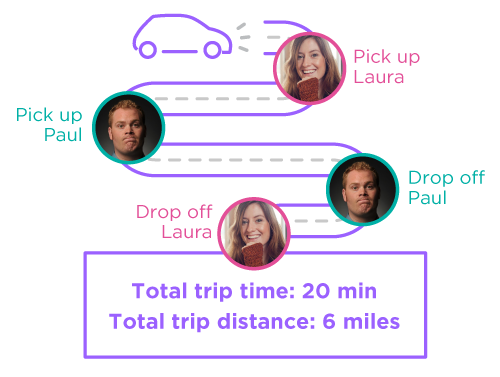 You can let them know that they should request another Shared ride with the right pickup and drop-off locations or standard Lyft if they have multiple stops. We recommend sticking to the app's route recommendation and avoiding inefficient routes. On rare occasions, we'll automatically adjust your payout if the trip is significantly longer than our estimate. If the first passenger cancels and fits the cancellation fee criteria or you mark them as a no-show, you'll get the standard cancellation fee. Because we use actual time spent and distance traveled to calculate your earnings, a cancellation on the part of the second passenger is automatically factored into your earnings for the ride in the form of the time and distance spent driving to their pickup location. For example, you may go a mile or so out of the way to get your second passenger and spend an extra few minutes. This amount of time and distance will be factored into the total pay you receive, whether or not they're picked up.